One of the most tempting ideas to hit the world of business is that of creating “work / life balance” – in fact, many consider it the holy grail of goals. Lack of work / life balance is blamed for all the ills that befall us, and (especially as small business owners) we ache for the day when we’ll achieve this elusive goal. The problem is, “balance” is the wrong goal. Imagine, if you will, that you’re about to step out onto a tightrope. Your arms stretch out to either side, a tray upon each arm; one labeled Work, the other Life. The trays hold an array of items, carefully positioned to maintain balance. As you step out onto the rope, you feel confident that you can maintain your balance, holding each tray just so to keep anything from being dropped. But after a few steps, something comes along and drops a rock on one of the trays. Or perhaps a heavy wind blows something off. You teeter, you wobble, you almost drop one (or both) of the trays… but with effort, you regain your balance and continue on your way. A few more steps and it happens again. Maintaining balance takes constant effort, and every change on one side or the other threatens to throw you off your balance. Of course, before you can even get to the “maintaining” stage, you have to achieve balance. Unfortunately, most tools and tactics for doing so are designed to work for a very specific type of person (basically, the person who developed the tactic). If you don’t fit the type that a certain tool is built for, you’ll have very little (if any) success using it… and if you’re like most people, you’ll blame yourself instead of the tool. There’s an even bigger problem with trying to arrive at a “balanced” life… most of us don’t even know what that actually means! Does that mean you spend equal amounts of time between Work Time and Personal Time? What about time with friends vs time with family? What about time spent on self-care? Or taking care of the house, or running errands, or or or ??? 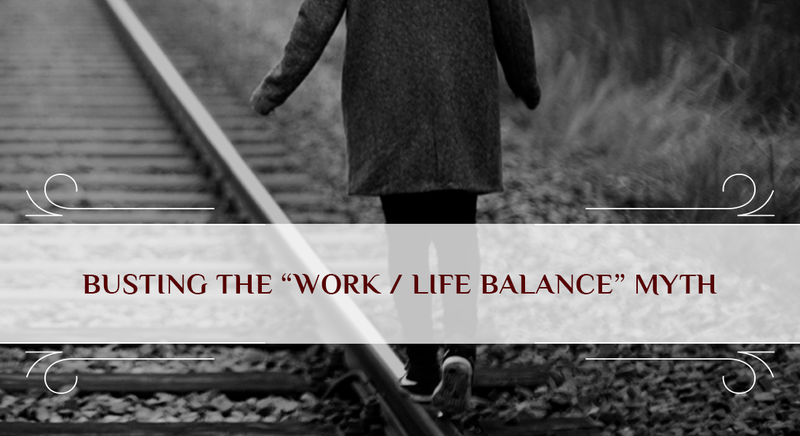 More often than not, “work / life balance” is approached as a vague concept, an “I’ll know it when I get there” sort of thing. But the truth is, if you don’t know specifically what it is you’re trying to achieve, it’s pretty much impossible to achieve it. And missing the truly important moments in our lives. “Balance” promised to fix all that. So if we can’t have balance, what can we have? Balance is hard to identify, and even harder to maintain. Boundaries, on the other hand, are solid. And the longer you have them, the easier they are to maintain. Once you’ve trained your family and friends to respect your boundaries around Work Time, they’ll be more willing to respect the need for (temporarily) extending that time while you work on a big project… like for that book you’ve been meaning to write! Once you’ve trained your clients to respect your boundaries around Personal Time, they’ll be more willing to respect the need for (temporarily) limiting that time while you take time for yourself… like for that much needed vacation you’ve been promising your family! And once you’ve trained yourself to respect your boundaries around both Work Time and Personal Time, you’ll find that you get far more work done when you’re “on the clock”… which will leave you far more energy for enjoying the time spent with friends, family, and yourself! Of course, if you haven’t been in the habit of setting (and enforcing) boundaries, it can be a little tricky to start. It can be tempting to go all-in, all at once. We’ve become a society of instant gratification junkies, and the promise of achieving perfection right now can be very seductive. Unfortunately, that’s pretty much a recipe for disaster. Clients who are in the habit of calling day or night, evenings and weekends, won’t be too pleased if you suddenly tell them to only call during business hours. Children (and certain other family members) who are used to having constant access will definitely throw fits if you’re suddenly unavailable. Your own traitorous brain will burn countless calories trying to shift you back into old habits… wasting time when you’re supposed to be working, worrying about work when you’re supposed to be enjoying the company of your family, and then keeping you up at night worrying about everything when you should be sleeping. So how do you engage healthy boundaries, in a way that will ultimately lead to success? Instead of trying to overhaul everything all at once, focus on small, incremental changes over time. If your clients are used to having constant access to you, start letting your phone go to voicemail in the evenings – anytime after 7 to start, then moving to 6, and eventually 5 (or whatever time you set as the end of your work day). If your children are used to having constant access to you, start shutting yourself away for 15 minutes to an hour at a time (the younger your children, the shorter you’ll likely want to start with). As they get used to this “No Children Allowed” time, extend it – 15 minutes becomes 30, becomes an hour, becomes an hour and a half, etc. In the meantime, keep the long game in mind – knowing exactly what your end goals are will make it much easier to decide how and where to implement your incremental changes. Communicating your end goals with the pertinent people (and explaining to them why you’re engaging these new boundaries) will help them buy in to the concept as well. Let your clients know that you’re consolidating certain tasks (like taking / responding to emails and phone calls) to certain times of day so that you can be more focused and serve them better. Let your children know that you need uninterrupted time to work on your business so that you can finish faster and have more time with them. Remind your traitorous brain that it’s important to stay focused on Work Time when you’re at work so that you can be free to enjoy your Personal Time when you’re not working*. Remember, people are more inclined to accept new boundaries when they’re framed as being beneficial to them, rather than a rescinding of previous “rights” or benefits. The sad truth is, the hardest person you’ll have to train to respect your new boundaries is yourself. We have a bad habit of trying to take care of everyone else first, and it’s this bad habit that’s created the horrible boundaries you’re currently dealing with. Telling yourself (and the other people in your life) that you’re going to engage these new boundaries around Work Time and Personal Time won’t do any good if you allow yourself and others to ignore those boundaries. Unfortunately, I can pretty much guarantee that you will let this happen. Probably multiple times. A client will email you with an EMERGENCY(!!!) and you’ll feel compelled to answer right away. Pro tip; unless you’re a surgeon of some sort, I can pretty much guarantee that 99.9% of “emergencies” are not, in fact, emergencies. Everyone will survive if you wait until the start of business to get back to them. In the meantime, you can setup an auto-responder that replies to after hours emails telling them when to expect a reply… this helps to avoid the dozen escalating emails that certain panicked clients may be prone to sending when they don’t hear back from you immediately. Your child will throw a huge fit when you shut the door to your office… or when you try to leave to go work somewhere else… and your heart will break and you will feel compelled to stay and focus on them. Pro tip; unless your child is bleeding, has a broken bone, or lit the house on fire, they will get over you being inaccessible for a brief time. If you’re working in the house and can’t ignore the fuss, a good quality pair of headphones and your favorite music will come in really handy while they learn this for themselves. First, remind yourself – hourly if necessary – that these boundaries have been engaged for the good of the people in your life as much as for yourself. Your life will be better once they’re firmly in place, AND the people who are important to you – your family, your clients / customers, everyone you engage with – will benefit from your improved focus and energy. Allowing your boundaries to be repeatedly ignored screws everyone, not just you. Second, when this happens, acknowledge that you slipped up and allowed your boundaries to be ignored… and then forgive yourself. It’s just your brain sinking into old grooves. The good news is, it’s a learning opportunity. So learn from it, and move on. Would you like to know more about boundaries, and how to effectively engage them in your work and life? I’ll be talking about this a LOT more, along with a number of other concepts that will make your life as an entrepreneurial parent much much better. Sign up below to get it all straight to your inbox, easy as pie!